The Custom Aluminum Bottle Opener Key Tag from AnyPromo is a compact and convenient bottle opener made of premium aluminum alloy. 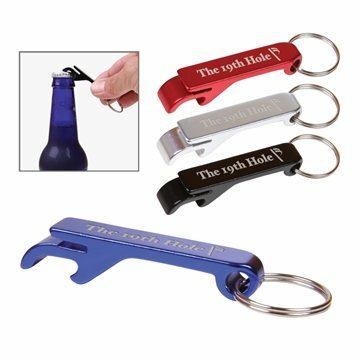 Not only does this small, lightweight bottle opener pop off bottle-caps with ease, the reverse-side can open flip-top cans. Available in 4 colors (silver, black, red, blue) with Laser Engraving for your logo on an area of 1 1/4" x 1/4". 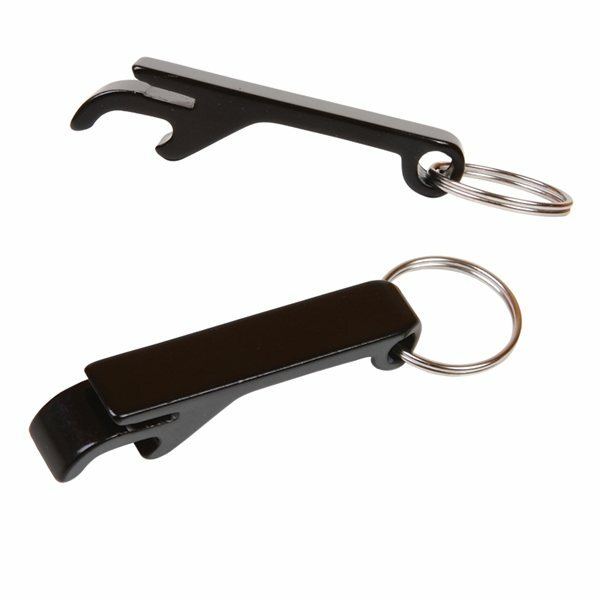 These key-chain bottle openers are a customer-voted "Top 100" item because people really like them, and will keep these on a set of keys for years because they are useful and aren't too bulky. 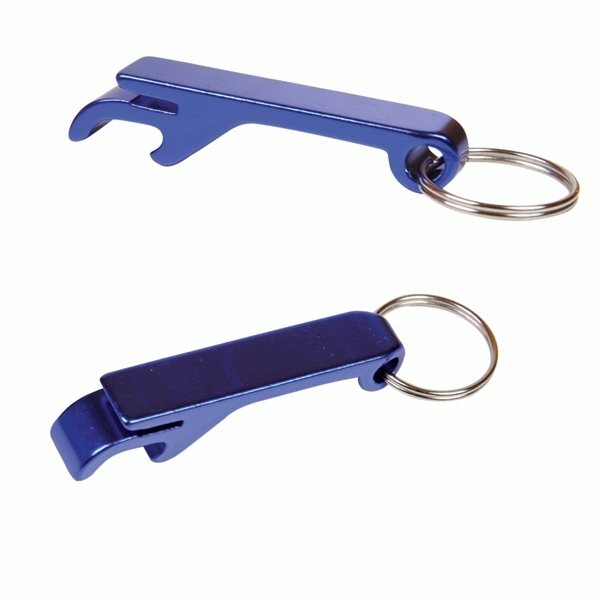 These bottle opener keychains are also very popular to attach to coolers, beach chairs, or anywhere that a bottle may need to be opened. Whether you're looking for a great giveaway or small, branded knickknacks to display at checkout, aluminum bottle openers are a solid choice! 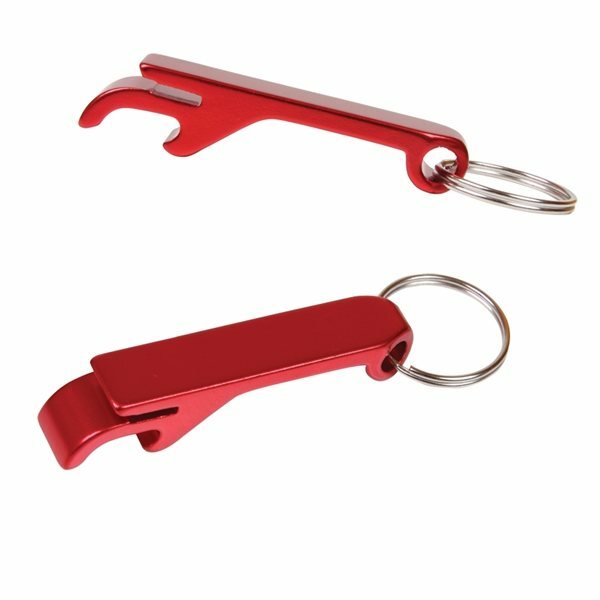 Aluminum bottle opener keychain is the same style as our plastic custom bottle opener keychain. Custom bottle opener keychain is designed for opening bottles and flip top cans. The custom bottle opener keychain offers a silver/white laser engrave option. Metal split ring comes attached to the custom bottle opener keychain. This aluminum bottle opener has a key ring at the end to conveniently attach to a set of keys or a cooler. Features a can opener on the reverse side. Great for preventing broken nails when opening a can of pop. Customize this bottle opener keychain with a 1 1/4" x 1/4" Laser Engraving across the top. 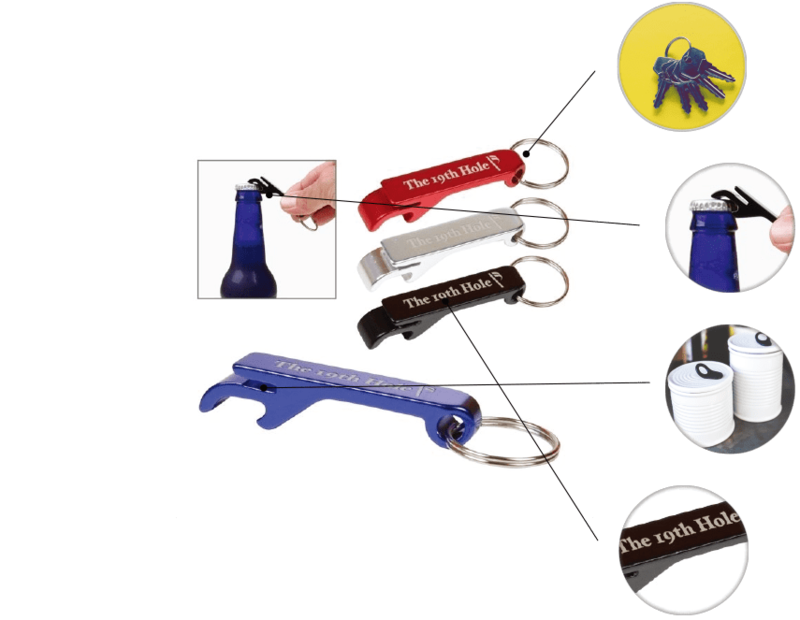 Need custom bottle opener keychains in a hurry? Get free 1-day rush when ordering this product from AnyPromo. Very pleased with the quality and more impressed and appreciative of the assistance Jorgina provided. I couldn't have gotten it done with out her. Met my expectations and I love it. However, any promo gave me a little run around with the font style selection. I will prefer that the exact selection made from Anypromo website for the font font style be used. Good solid can opener. Handy little key chain to have with marketing logo on it. Everyone loves these.